Aaron Cole December 25, 2018 Comment Now! 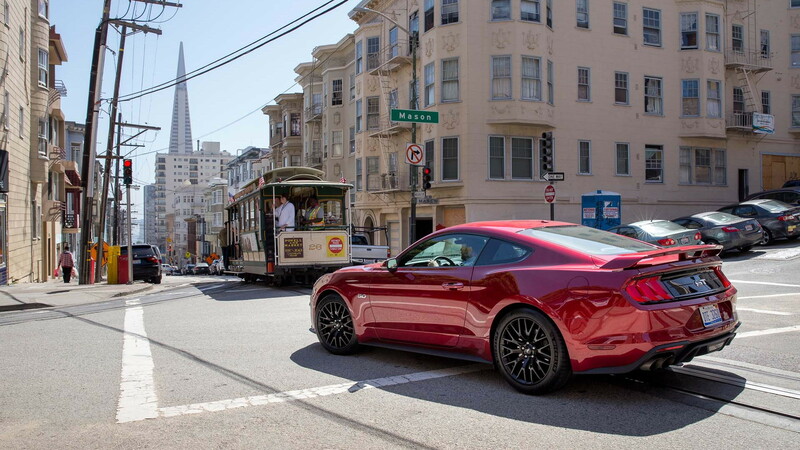 Across the Nob Hill and Russian Hill neighborhoods of movie history, Frank Bullitt’s battered green Mustang Fastback bounds over hills and through narrow streets. It chases an unyielding and seemingly indestructible Dodge Charger for more than 10 minutes on film. Through North Beach and Chinatown, near Frank’s apartment at Taylor and Clay, near Coit Tower, around Broadway, the famous chase immortalizes a world of imagination created in two weeks in an editing room. 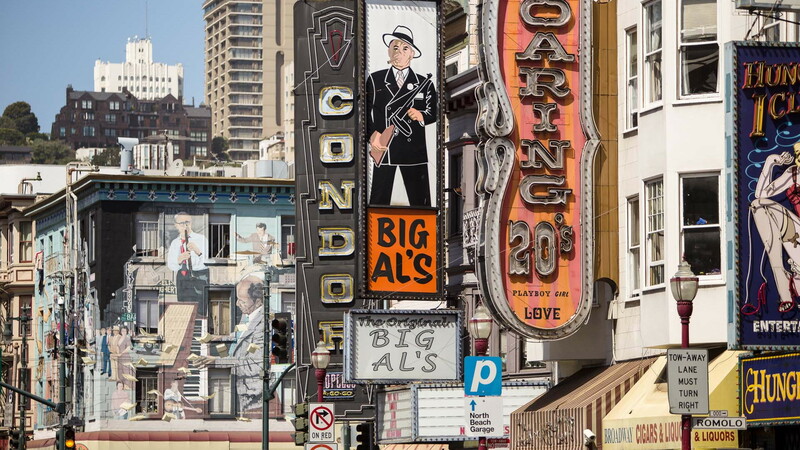 San Francisco’s Broadway—the real Broadway—is a seedy 2.7-mile mess of detestable vulgarity and destitution in places, bookended by idyllic Bay Area affluence. It’s wonderfully nostalgic and brutally real in others. The real Broadway lacks the polish that the king of cool once gave us. The real Broadway is a sign of the schism between utopia and dystopia, the kind of negative space that only reality creates today. At its heart—the heart that people will find looking for the world of “Bullitt”—flickering neon bounces off aging signs from skin joints like the Hungry I Club and Hustler Club into burgeoning restaurants and literary holes-in-the-walls, beatnik Babels. All of it is real, and all of it is raw. Ryan Maxey knows those sides of Broadway, and everything in between. Ryan owns Naked Lunch, a restaurant at 504 Broadway named with a not-so-subtle nod to his neighborhood’s sandpaper-rough alley where vice can be a window dressing sometimes. It’s a neighborhood place, the real neighborhood place. DON'T MISS: What does the Ford Mustang mean to America? Naked Lunch is also ground zero for Bullitt’s Broadway and San Francisco’s, too: the restaurant is directly downstairs from the sign for Enrico’s restaurant, a visible tie that binds movie history to present-day reality. It’s also where Maxey, since the 1990s, has watched the dot-com world boom and bust, Silicon Valley’s draw and repulsion, and the original San Francisco Broadway claw its way back into relevance again. “Places like this, they always come back. It’s just a matter of time,” Ryan says in an afternoon lull, post-lunch rush of reflection. Naked Lunch closes after 4 p.m., when Broadway changes its attitude and clientele. It’s not a big bet that he’ll stick around for Broadway’s next up from its current down but he’s here for now. 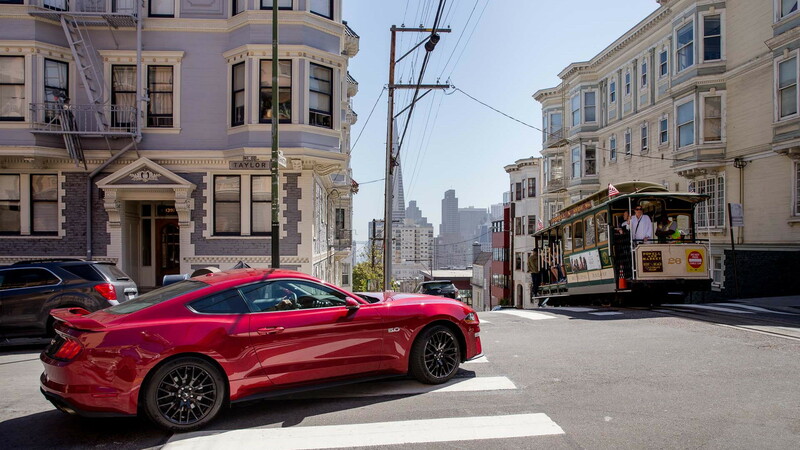 Look closely at the Ford Mustang and Steve McQueen and it’s not hard to draw parallels between those two, and the streets of San Francisco it helped make famous. The Mustang was Frank Bullitt’s car. But it was also James Earl Ray’s car. 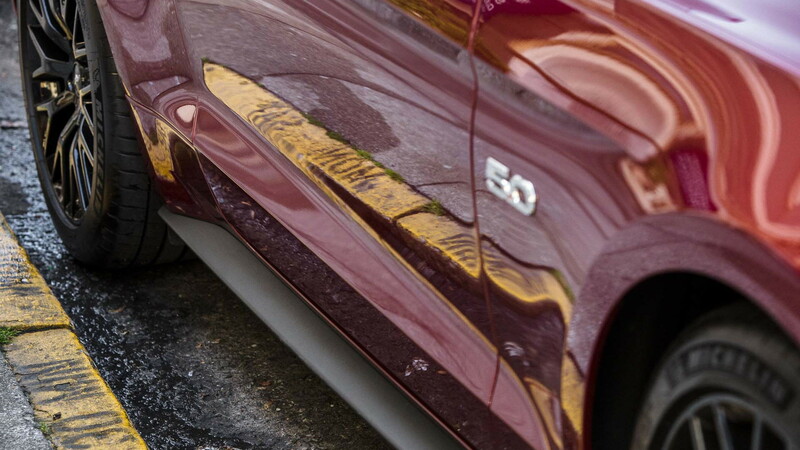 For all its fame the Mustang has its infamy, too. McQueen’s life was similarly tumultuous. Just as difficult as the history some associate with the lonely, orphaned, and temperamental actor, he’s universally revered as the exact opposite: “cool,” everyone wanted to be near him. A postmodern superhero whose own body betrayed him with cancer far too young. Broadway—the real one—attracts and repels. Ryan looks out on the particle-board brown empty storefronts that have been vacant for years near his restaurant, maybe close to a decade, and wonders how their owners can cling to an idea that’s long gone. Despite his discouraged tone, Ryan’s attitude is upbeat and forceful. He sees value in the neighborhood that brings him regulars and passersby like me. His tone and approach with familiar and unfamiliar customers is the same—come in, sit down, watch the Warriors, have a beer or lunch. Behind his full beard and tattooed, folded forearms, he smiles in a broad satisfied way that speaks to his optimism—and pragmatism. A new Mustang sprayed in Dark Highland Green parked near Maxey’s restaurant gets a second look and a smartphone snap. The boarded-up window with a promotional comedy poster from 1997 near countless defunct storefronts doesn’t. Broadway doesn’t have the pedigree that other famous streets in San Francisco have. It missed out on the Twitter-loin jackpot of Market Street, doesn’t clang with streetcar tourist swagger like Powell, isn’t all elbows like Lombard. 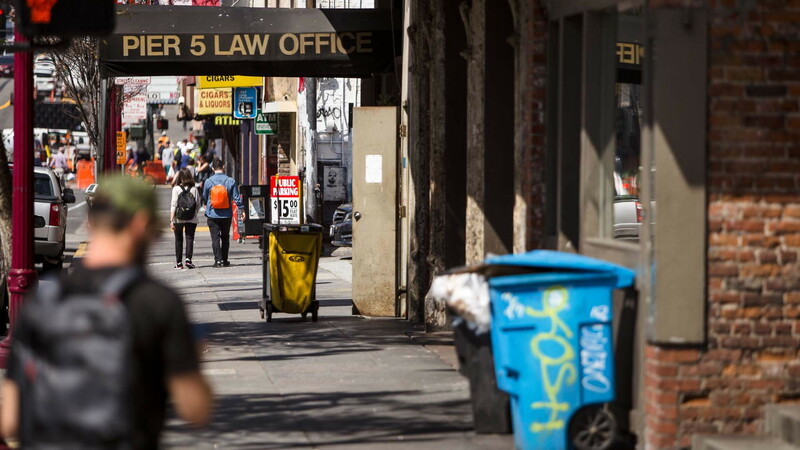 It lacks the historical significance of Grant Avenue—one of the first streets named when the city was called Yerba Buena—but Broadway’s roots go back before 1852, when the street appeared on a map by Britton & Rey. Then, Broadway bounded San Francisco’s Barbary Coast, an infamous red-light district during the city’s gold rush boom. The few women in the city during those early boom-town days may have worked there in the world’s oldest profession, and nearby ghettos filled with workers from China and opium dens set the table for Broadway’s checkered relationship with the city around it. In some ways, it’s never gotten better. Broadway’s schism with the city became a beatnik draw more than 100 years later. Allen Ginsberg’s “Howl,” a peyote-fueled nightmare told in three acts, was first sold at a bookstore on Columbus and Broadway. It was pulled several times for being indecent. Ginsberg’s local bar, Vesuvio, is next door to the bookstore—across Jack Kerouac Alley—and still open until 2 a.m. every goddamn day of the year. Life is a bad item, short but pointless. You stand at the bar and play Liar’s dice with fate. It’s the San Francisco way. You might win and even if you lose the scenery’s great and the weather isn’t too bad. Janet Clyde manages Vesuvio and has been in the neighborhood for 40 years. She’s watched the neighborhood move like the waterfront near The Embarcadero. North Beach neighborhood has had working-class to upper-class and every shade inside and outside those lines as long as she’s been around. Vesuvio is a place where the clientele could pay cash for a car, now—or barely scramble the change together for the beer in front of them, now. A projector flashes images from postcards on the wall that change for the season, but the idea is same year-round—there’s an idealized world out there, and there’s also the real world for the rest. “Money is a barbaric force,” she says. Clyde recalls the Broadway neighborhoods where garbage men and stock brokers lived next door. When the financial district and the red-light district weren’t on so-different sides of the same street. “It’s a mixture of a neighborhood. You needed everybody. You had cab drivers who lived in the neighborhood. You had bartenders who worked in my industry…we had a mixed urban neighborhood with some long-established families,” she says. Clyde came up from L.A., where life was more expensive. When she made it to San Francisco, the artists had already been priced out to The Mission—but some were left. Inflation-adjusted, the Ford Mustang that debuted in 1965 would’ve cost less than $19,000 in 2018. Now, the red 2018 Ford Mustang parked out front costs more than twice that—20 times more than the $2,372 needed in 1965 dollars. By the time the Dark Highland Green Mustang was immortalized in 1968, the pony car wasn’t any less affordable—$2,955 for a GT Fastback. Bullitt’s Mustang would’ve been equally at home on both sides of Broadway—real, or on celluloid. That car, made an icon by everyman’s cool actor, Steve McQueen, never existed. The real car made by Ford, sold to middle, high, and low America most certainly did. McQueen, in the real world, was hardly as cool as his character, too. Like Broadway, capitalism’s creep has left shells that history has spit-shined after generations have left. Like Broadway, we can revisit the past and argue about the barbaric forces that have driven an icon like the Mustang away from America. Like Broadway, the Mustang and McQueen and a single 2.7-mile stretch of America will always boom, bust, but always come back. It’s just a matter of time. Correction: An earlier version of this story misidentified one car from "Bullitt." The Dodge Charger was used for the film's chase scene.